If you plan on attending the University of South Dakota football game on Saturday, be on the lookout for one of these fliers on your way into the game for your chance to win a $100 gift card to the USD bookstore. USD cheerleaders will be handing them out to fans just inside the doors of the Dakota Dome. The contest is simple. Like us on Facebook, enter the unique four-digit code on the flyer and you’re in. You will have until Wednesday, October 3rd to enter and the winner will be announced next Thursday, October 4th. And if you plan on tailgating, be sure to find the Amazing Corn Adventure trailer. Our staff will also be giving away free nachos! So while you’re cheering for the Coyotes this Saturday afternoon, visit the link below to “Like” South Dakota Corn and enter the contest from your mobile device. 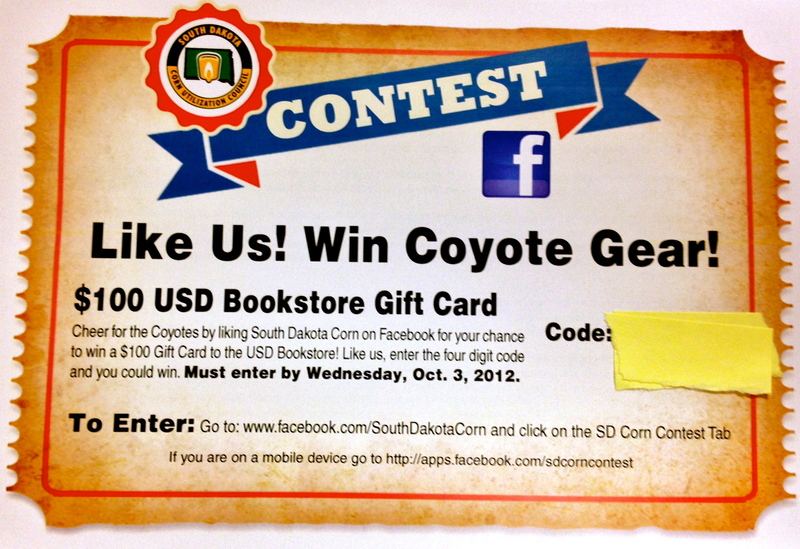 This entry was posted in News and tagged Coyotes, Facebook, football, South Dakota Corn, tailgate, USD.